As this industry becomes more active in Iowa, local officials and community members need to be aware of the potential effects it could bring to their lives and the local economy. 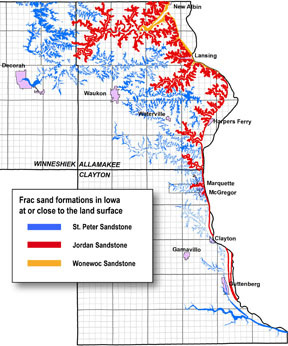 Frac sand mining is an emerging concern for people in Northeast Iowa. This concern has prompted questions regarding potential impacts on water quantity, water quality, recreation and tourism amongst others. In a new Iowa Policy Project report, “Digging Deeper on Frac Sand Mining,” we examined potential impacts of this industry on the environmental, economic and aesthetic assets of Northeast Iowa. Particularly with regard to water resources, we identify unique features of the region that warrant extra precaution such as trout streams and the prevalent karst geology. Well-rounded, crush-resistant sand prized by the fracking industry is found in several areas of three Northeast Iowa counties. The potential impacts of frac sand mining on water quality and water quantity include changing local groundwater flow patterns and increased sedimentation of waterways through overflow and runoff events. The exceptional waters and pristine environments found in Allamakee and Winneshiek counties contribute to the local economy drawing anglers and boaters. This led to $68 million in domestic travel expenditures and over 500 travel-related jobs in 2012 within these two counties. Frac sand mining in the region has the potential to affect this tourism-based economy in unforeseen ways. In fact, several economic studies from Wisconsin have shown that the costs associated with frac sand mining may exceed the benefits when comparing other economic activities in the region. State regulations and local ordinances have an impact on the growth of this industry within a region as shown in this report’s comparison of Minnesota and Wisconsin activities. Wisconsin is shown to have less restrictive regulations than Minnesota, which has assisted the explosion of frac sand mining in Wisconsin. These comparisons should inform local officials of different strategies and outcomes when drafting frac sand mining ordinances. They do have options, including hydrologic mapping, local well monitoring, and setbacks from trout streams and sinkholes. This research was produced with the generous support of the Fred and Charlotte Hubbell Foundation.